SOAPBOX CREATIONS: New Simon Says! Have you seen the new Simon Says Release? It's called Cold Hands Warm Hearts and there is LOTS of new fun stuff! Click HERE to do shop shopping today! I will be back soon with a card using products from this release! 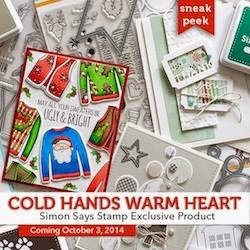 Love the new stamps and as always the blog hop :) Looking forward to your design!! Thanks for sharing your talent and crafty inspiration! Hi! Great cards! Just bookmarked your blog so I can follow along for inspiration!